Today was the day I decided to pull the shallots. 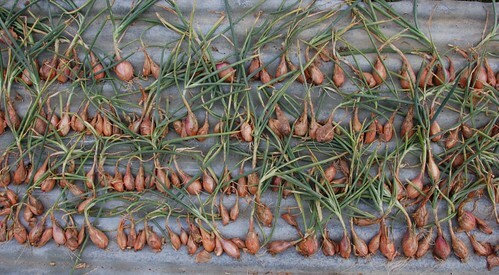 I'm really pleased with them; from each bulb start I've harvested four or five good sized shallots with minimal effort or intervention required along the way. The variety was Longor, a French selection of the long bulbed type of shallot, pink skinned and well regarded and we bought them from Tuckers but they don't seem to be in the current catalogue. Generally speaking shallots are best when they are from a line that rarely flowers but most of the round shallots available as sets are seed raised and I find these quickly revert to type when subject to my sort of gardening so aren't much use to me. I was pleased to see that none of these made the slightest effort to put up a flower. I thought I had blogged about planting them and the onion sets but can't find an entry. Checking over the photos reveals we prepared the bed on the 3rd of March and by 25th April they were sprouting well, so I'm guessing they were planted in March making about five months in the ground. I've hoed the plot a couple of times since then but haven't bothered to water or anything more strenuous like that. It's not always been so easy, one year we had terrible mildew on all the alliums, other years the bed has been swamped with weeds but this year it was just right. I've laid them out to dry - no rain to speak of is expected for another ten days - then I'll take the best 30 into store as starts for next year, pickle the smallest and bag the rest up for use between now and Christmas. We never seem to grow enough onions no matter how good the yield.